The value of an Indian Penny ranges from $1 to $2 for common dates in worn condition. However... here are three ways to find a higher value. First, if your coin was minted in the early years 1859 through 1878 most are worth $8 to $40 or more. Second, Indian pennies have a few dates that are very valuable. For example, every Indian Head Penny collector needs an 1877 to complete their set and the price begins at $367 for a coin in the Good grade - very worm. Third, the condition of your coin is very important in determining value. Indian Pennies should be examined closely and a "Grade" assigned. Necessary to discover an accurate value. See below for more help on grading your coins. The Uncirculated 1909 Indian Penny pictured is an example of a very collectible coin. Although as a date it is not scarce or rare, this coin is worth well over $32 because of above average condition. The following charts show there is a wide range of coin values of the Indian Head Penny. If you determine any of your coins are valued in the hundreds of dollars, absolutely have them graded by either NGC or the PCGS grading service. Compare the condition of your coins to the ones pictured below and find the closest match. Focus your attention on the band of the headdress. If all the letters to "Liberty" are present, the coin is in Fine condition. Less than all the letters and the grade drops to Very Good, no letters visible and your coin is in Good or worse condition. Use a magnifying glass and look closely at your coins, determining a higher grade enhances the value of an Indian penny. It is possible to find one in "extremely fine" or even in "uncirculated" condition. Realize what seems like a small difference in appearance often leads to a large difference in the value of an Indian penny. Also, experience and skill is required to accurately grade and determine the value of an Indian Penny in uncirculated condition. Collectors and dealers consider PCGS and NGC as leaders in coin grading services. They both authenticate and grade your coin. The small fee paid provides assurance you understand and receive the full value of your coin. Investigate dealer's listings, look for those offering Indian Head Cents for sale, for the higher priced coins, their listings and prices usually include a notation of the NGC or PCGS assigned grade. Additionally... these coin dealers are potential buyers of your coins. 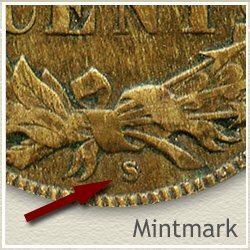 In 1908 and 1909, the mint in San Francisco produced Indian Pennies and put an "S" mintmark on the reverse under the wreath. Both dates are rare and valuable, more so the 1909-S with a value of $243 in Good condition. The next big standout date is the 1877. Every collector of Indian Pennies would like the 1877 in their collection and knows its value. Another desirable coin, the 1869/9 requires a magnifying glass to detect the two nines, one slightly over lapping the other. To quickly understand some of the differences that make a coin valuable, visit rare coin dealer sites. 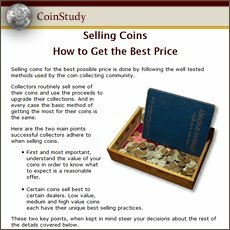 Look for and compare coins similar to yours. The value of an Indian Penny has been steadily increasing over the years. It is a very popular series with collectors. They are always looking for a better condition coin or need a rare date to complete the series. Keep in touch with values, return here whenever curious. Bring your box here and discover all your coin values. Viewing the video - Grading Indian Head Pennies - important details are highlighted helping you judge the best grade of your coin. Also on the page are detailed images and descriptions. Once these details are pointed out (some subtle) it then becomes easier to value your coins. Perhaps consider your coins as the beginnings of a collection. One successful approach is to sell your coins and use the proceeds to purchase one nice rare coin... the one you where hoping to find in the box. Pass the thrill of a rare and valuable coin on to your children.